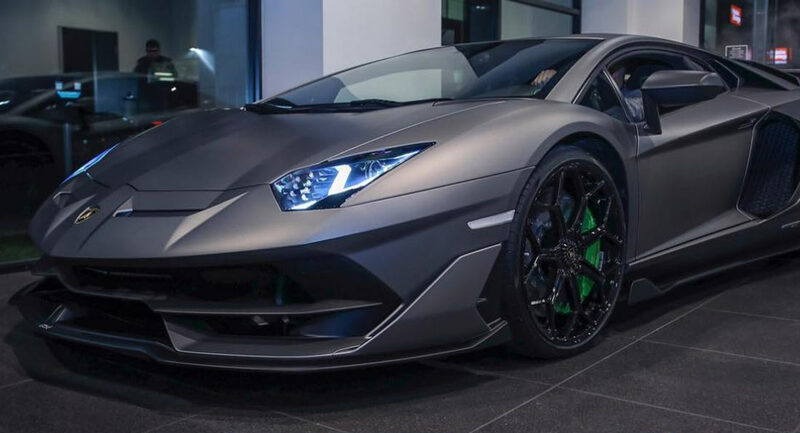 The Lamborghini Aventador SVJ may look like just another supercar to many, but the automaker plans on only building 900 examples, and this is the first one in Grigio Titans, a dark matte grey. The SVJ is a powerful, track-focused version of the Aventador S, powered by a 6.5L L539 V12 engine that has been tuned to produce 759 hp at 8,500 rpm and 531 lb⋅ft of torque at 6,750 rpm. It weighs in at just 3,362-pounds, thanks to the extensive use of carbon fiber and titanium in the exhaust system, giving it a power-to-weight ratio of 1.98 kg/hp, enabling the vehicle to hit 62 mph in just 2.8 seconds and achieve a top speed of over 217 mph. Read more for additional pictures of this stunning color and additional information. “Not satisfied with just a matte grey finish, the owner opted to have the ‘J’ on the vehicle’s rear quarter panels finished bright red. There’s also green calipers that tie everything together. The interior is also exceptional. As with most Aventadors, there’s the usual mix of black leather, plastic, and Alcantara but to ensure this cabin was unlike any other, a plethora of green accents are found throughout,” reports Car Scoops.